There’s little that causes more angst in parents than the thought of taking a road trip with a preschooler in tow. The never ending chorus of “Are we there yet?” coupled with nonstop requests to use the bathroom or stop for food is enough to make even the most joyful parent sing along to the blues. While it can be tempting to put a DVD in and loop it continuously for the duration of the trip, or give your preschooler unlimited access to the iPad, using a screen to entertain your preschooler isn’t your only long-ride entertainment option. Before pulling out the electronics, try these low-tech ways of engaging the kids. 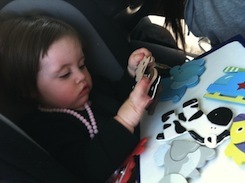 Utilize a Magnet Board – A cookie sheet doubles as the perfect magnetic lap board for long car rides. Place an assortment of number, letter, shape, and animal magnets on the cookie sheet and let your child have fun. Magnets can also be used to hold paper in place on the cookie sheet for coloring and writing. If your child is into arts and crafts, consider purchasing a few simple craft projects at the local dollar store. A cookie sheet with a lip makes a great work surface and can help contain the mess. Pack Snacks – There’s something about a car ride that makes kids hungry. Packing an assortment of healthy and special treat snacks can serve as the perfect distraction for complaining preschoolers. Fresh fruits, homemade trail mix, bottled water, and 100% fruit juice are perfect for preschool hands. If your child has a favorite special treat snack, packing it for the ride may curb a pending meltdown. Ziploc bags, or their eco-friendly cloth counterparts, are great for portioning out snacks on the go. Play Car Games – From iSpy to Name that Tune, there are plenty of family-friendly kids games preschoolers can get in on. Consider printing off a map of the United States and have your preschooler look for a license plate from each state. Have him color the states in as he finds matching license plates. Have a Bag of Tricks Ready – Hit the local dollar store and purchase an assortment of small, gimmicky games for your preschooler to play with during the drive. Wrap each one individually and place them in a brown paper bag. During the trip, dole out the goodies as a means to reinforce good behavior. Plastic rings that light up, small figures and action men, small books, kaleidoscopes, and stickers and sticker books are all great options for the preschool set. Make Sculpture Art from Foil– Bring along a roll of aluminum foil and you’ll be surprised what comes next. Give your preschooler a large piece of foil and let him construct his own masterpiece. Turn this activity into a game by taking turns sculpting items and having the others guess what the sculpture is. The person who guesses correctly gets to be the next sculptor. For car rides that are more than a few hours long, putting on a movie or playing around with iPod apps can certainly be a life saver, but it’s good to know there are other preschooler-approved ways to withstand a long car ride. The next time you’re heading out of town, consider some low-tech entertainment options. Spending time together in close quarters provides an opportunity to rediscover each other’s likes, dislikes, and interests. Doing so can be a welcome break from the busyness of life and provide the perfect opportunity to reconnect.